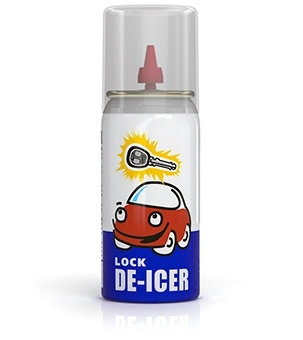 Spray for car lock defrosting. Quickly unfreezes the iced parts of the lock mechanism and recovers their mobility. Defrosts ice and removes moisture from the surface of the parts, prevents their further freezing. 2. Spray the content (2-3 sec.) into the keyhole. The lock will thaw in a minute. It is recommended to use LOCK DE-ICER every 2 weeks in winter.